This elegant bouquet includes Avalanche Roses, Delianne Chrysanthemums, Santini Ferry Chrysanthemums, Germinis, and Gypsophila. 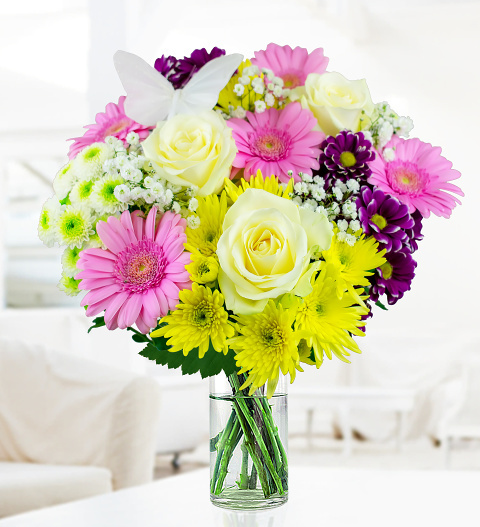 Each flower stem is carefully selected and arranged to ensure quality and satisfaction. We have also added a beautiful butterfly pick for that extra special touch. Each bouquet comes with a Free box of chocolates to make this a truly complete gift for all occasions! Spoil somebody special for their birthday, anniversary, or any other happy occasion when you send this flower arrangement. Chocolates may contain nuts.